CHEMICAL PLANT: Under agreement, Gulftainer will build a new container facility at former DuPont site in Wilmington, Delaware. Under terms of preliminary agreement, GT USA will make annual royalty payments to Delaware. Gulftainer agrees to invest $580 million in the port of Wilmington over the next nine years. GT USA will establish a training facility in Wilmington for jobs in the ports and logistics industries. 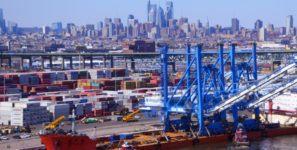 Officials of the State of Delaware announced last week that the state has reached a preliminary agreement with the Gulftainer Group to lease the Port of Wilmington from the state and construct a new container shipping facility on the Delaware River. The Gulftainer Group is the largest independent, privately-owned port operator in the world. The company currently operates 15 ports and logistics facilities across four continents, including North America. Gulftainer has operated the Port Canaveral, Florida, for nearly four years, establishing the Canaveral Cargo Terminal as a significant new port gateway. The introduction of new container and containerized cargo services at Canaveral contributed to an increase in cargo volume of more than 150 percent in 2017. The port of Wilmington embarked on a potential outsourcing venture in 2016, when the Diamond State Port Corporation commissioned a strategic master plan, the outcome of which suggested a public-private partnership would be the best way for a small state like Delaware to fund port improvements. The scheme contemplated that all port operations would be relegated to a contractor under a long-term lease and that the contractor would be obligated to invest in port improvements and expansions. Bids from potential port operators were submitted in August 2017. Under terms of the preliminary agreement, Gulftainer’s subsidiary GT USA would make annual royalty payments to the State of Delaware, which could grow to $13 million over the next decade. The company also would agree to invest more than $580 million in the port over the next nine years, including $410 million for a new container facility at DuPont’s former Edgemoor site, which was acquired by the port authority in 2016. Construction at the Edgemoor site would begin by 2022. GT USA would also establish a training facility at the Edgemoor site for jobs in the ports and logistics industries. The Board of Directors of the Diamond State Port Corporation (DSPC), the public entity that owns and operates the Port of Wilmington, must approve terms of the agreement. Members of the Delaware General Assembly also must approve the agreement. Under terms of the agreement, GT USA would lease the Port of Wilmington for a term of 50 years and would make royalty payments to the State of Delaware according to the volume of cargo that passes through the port. GT USA will guarantee that the number of jobs held at the port by members of the International Longshoremen’s Association would not fall below current levels.